TRTA 01 (zero-one) electric subway train. The train consists of 6 cars, of which 3 motorized and 3 trailers. All parts of the cars, including the framework, are made from light alloys. Very well done simulation with realistic sounds and photorealistic driver's stand. Speedometer with ATC-indication of highest permissible speed, upcoming signal aspect, and upcoming speed restriction. Manometer (pressure gauge), clock, pilot lamp and brake indicator. 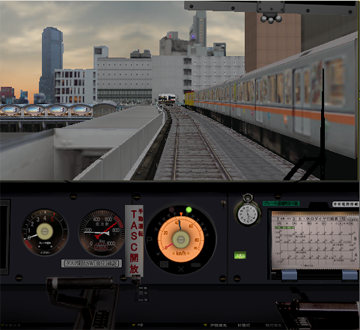 This train comes in a BVE 2 version with moving power and brake handles, which follows the simulation, and a version for BVE 4. Both versions works with OpenBVE. PageDown -Switches to the ATC safety system. Those trains have disappeared from the creator's website. Train for BVE 4, in OpenBVE to be placed in the directory LegacyContent\Train . Train for BVE 2, in OpenBVE to be placed in the directory LegacyContent\Train .